NASA research pilot Tom Ryan snapped this self-portrait while flying an ER-2 plane on a high-altitude mission over New Mexico in April 2011. For Joshua Graham, growing up in a small Florida town meant frequent trips to Kennedy Space Center to watch space shuttle launches. When Graham was five years old, he recalls seeing an astronaut's spacesuit in the Space Center's museum and telling his mother, "I want to work on these." Graham joined the Air Force at 17 to escape the town of St. Catherine, he told SPACE.com. That's when his first stroke of luck hit. Graham was assigned to work on flight suits for U-2 pilots at Beale Air Force Base in Northern California. Those flight suits are similar in construction to spacesuits, because the pilots skim the oxygen-poor stratosphere at an altitude of 70,000 feet (21 kilometers). "There's really not many places that still have what we do [at NASA]," Graham said. "The entire time I was in Florida, I was doing everything from running heavy equipment to cutting trees, anything I could do in order to make ends meet," he said. A contact at Beale kept sending Graham job links, and when an opening appeared at private contractor Computer Science Corporation in late 2006, the contact wrote Graham a recommendation. NASA life support engineering technician Joshua Graham performs a pre-flight inspection of a pressure suit. "I will never forget the day," Graham said. "I was working dragging brush. It was nasty, dirty work, and I got the call on Monday right after I finished my shift. I was so excited, I locked my keys in my truck after I pulled over to write the number down." The then-23-year-old landed the job. Now, almost seven years later, Graham is still there, working as one of three life-support technicians at NASA's Dryden Flight Research Center in Palmdale, Calif., contracted with Computer Science Corporation. At Dryden, Graham maintains life support suits for NASA's research pilots, who fly its two ER-2 aircraft, the civilian equivalent of the U-2 vessels.The bright orange flight suits are very similar to the launch-and-re-entry suits astronauts wear on spaceflights, but with a different neck and oxygen design, Graham said. When the suit inflates, it pushes up the helmet so pilots can't see. 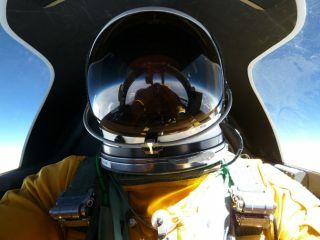 The $400,000 flight suits have a small plastic ball on a tether that pilots use to yank down the neck ring after the suit inflates, clearing their view. A small helmet hole allows access for straw-fed water bottles and meals from squeeze tubes. Graham and his colleagues prepare everything thepilots need, from the air they breathe to their ejection seats, survival items and parachutes. The support techniciansalso fit and dress the pilots in their suits, take them out and hook them up to the aircraft, and make sure it's safe for others to enter the aircraft after it lands. "All this was a childhood dream, then to wind up as a medical guy and get sent to Beale, then get the job here at NASA is really like being struck twice by lightning," Graham said. "There's really only one place that does what we do here, and I'm one of three guys. It's just very, very rare." Soon after joining Dryden, Graham's dream took another turn when the space shuttle landed at Edwards Air Force Base. "To get to go out on a shuttle recovery crew after growing up as a child in Florida and watching it come down was amazing," he said. "I felt like a circle had been completed." Email Becky Oskin or follow her @beckyoskin. Follow us @Spacedotcom, Facebook or Google+. Originally published on SPACE.com.